King Frosch Riesling Auslese received two awards, Best of Show and Platinum at the Winemakers Challenge. King Frosch just received word that three of our wines were 2016 award winners at the 8th annual Winemaker Challenge International Wine Competition. 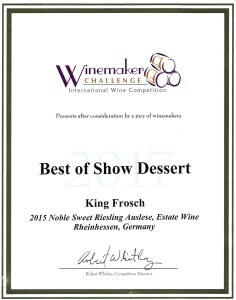 BEST of SHOW Dessert Wine: King Frosch 2015 Noble Sweet Riesling Auslese, which is also known as #8B on our website. It was also awarded a special Platinum Award. This means it received a point score on the 100 scale. The score it received was 95 points! SILVER AWARD WINNER: King Frosch’s 2014 Dry Dornfelder received the Silver Award. This isn’t surprising! One of our best-selling red wines, this is the second Silver Medal it has received. This delicious, earthy dry red wine offers a full mouth experience with a clean finish. Light tannins, peppery finish. It’s also a rare dry red in the U.S., as the Dornfelder varietal is grown in limited quantities and not many are exported. This German estate wine is a winner. And remember, all King Frosch All Natural wines have no artificial coloring, or taste enhancers and they have the lowest levels of sulfites possible, which makes for clean, enjoyable drinking. Thank you to all the judges at the Winemaker Challenge International Wine Competition.